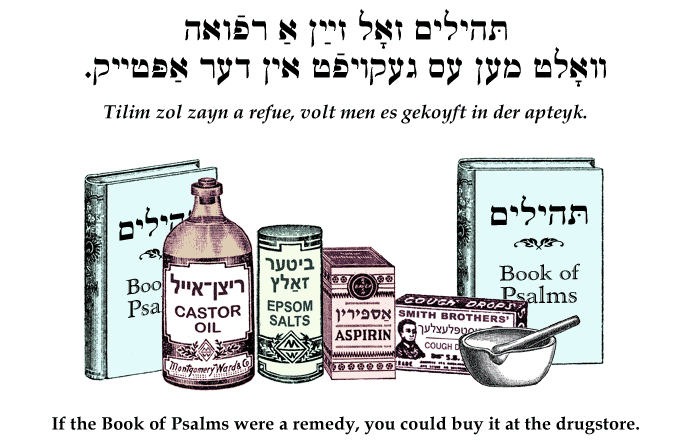 Yiddish Wit: If the Book of Psalms were a remedy, you could buy it at the drugstore. תּהילים זאָלֹ זײַן אַ רפֿואה וואָלט מען עס געקויפֿט אין דער אַפּטייק. Tilim zol zayn a refue, volt men es gekoyft in der apteyk. If the Book of Psalms were a remedy, you could buy it at the drugstore. It’s as helpful as reciting psalms to cure an abscess. Mit Tilim zogn ken men keyn vekslen nit tsoln. | .מיט תּהילים זאָגן קען מען קיין וועקסלען ניט צאָלן You can’t pay your bills by reciting psalms.